Home / Posts tagged "SOA"
Nichts desto trotz habe auch ich so eine Vorstellungswelt von SOA, wenn auch nur eine sehr einfache aus der Anwendersicht gestrickt. 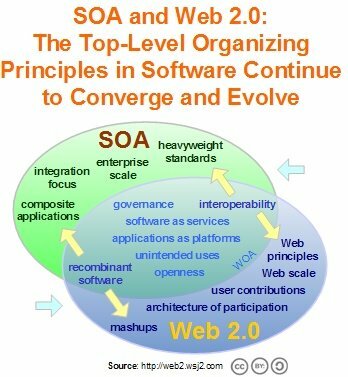 The issue of “Web 2.0 vs. SOA” has been getting a lot of coverage, here is an interesting synopsis. Phil Windley’s write-up from the InfoWorld SOA Executive Forum. “Two things are at the core of situational applications: SOA (service-oriented architecture) and (…) “enterprise mash-up services” reports Ulrika Hedquist from Computerworld. “One of the first technologies to limit integration complexity is service-oriented architecture. SOA is based on open standards that allow applications to dynamically locate and communicate with a software service. SOA simplifies integration by creating a homogeneous view of existing systems and data, but it doesn’t eliminate the need to aggregate and transform across applications and data sets.